This is a subject I’ve been meaning to write about for awhile. I outlined Lark’s allergy issues in her 6 month and 7 month updates. We did find out that she is allergic to dairy and egg, as well as cats. I was confused as to how I should approach these findings, being that I was still breastfeeding. I could adjust my diet to help her, or I could find her an alternative formula. Her allergist advised heavily against Nutramigen, since it’s still technically made from cow’s milk. He also mentioned that the amino acid-based formulas, like Elecare, are sometimes not covered by insurance and are VERY expensive. I proposed an idea to him that I had researched online, which was a formula alternative using rice milk as a base. As with the pediatrician, he felt breast milk was a great option, but said the rice milk alternative was a good choice as well. Like I said, I wasn’t sure what to do at the time, knowing adjusting my diet would be very difficult, especially since you can never be sure about hidden allergens in pre-made foods. But I eventually decided to commit to that and continue breastfeeding, at least until I knew she could tolerate the rice formula version. Within a few days, her skin was looking much better. The eczema was much less angry and we obviously were able to put an end to the vomiting and hives breakouts. Though she does still tend to get rashes and hives when she’s not feeling well, gets overheated, etc. She is her mother’s child with extra-sensitive, allergic skin! I also switched her soap, again…this time opting for the Eucerin Aquaphor Baby version and have started giving her colloidal oatmeal baths as well, which make her skin so soft! Her eczema has been flaring up the last few days, and I discovered today that her Burt’s Bees lotion we had been using on her has milk in it! So that lotion is pretty much a lost cause! But hopefully once she gets over being sick AGAIN and we get some new lotion, her skin will get even better! 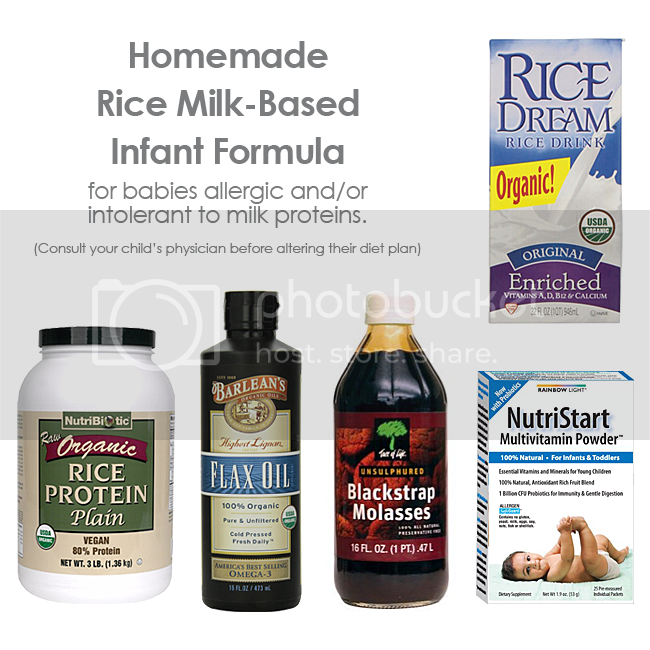 I ran across this post on another blog that had the recipe for this rice milk formula, as well as this post, and sort of combined the two recipes to fit our needs. Now, I am, by no means, a doctor or nutritionist, so please consult your child’s healthcare provider or nutritionist when trying something like this, especially when they’re as young as Lark is. But I will say, I’m a researcher to a fault. I read too many medical websites even though people are always saying not to! And I also read a TON of natural/holistic resources. My mother’s own experience with me as a baby has helped me in this tremendously and I’m never afraid to kind of “go off the grid” with remedies because I feel natural and/or organic recipes such as this can’t really hurt my child, especially considering traditional formula and cow’s milk enzymes are what’s hurting her in the first place. I’m down for any alternative at this point! Blend all ingredients together in a blender until combined. Store in the refrigerator for 2-3 days I use a glass container). I buy the enriched Rice Dream Plain milk for the added vitamins. One of the above mentioned recipes suggests gradually getting up to 4 tbsp of rice protein. I may increase that if I feel it’s necessary going forward, but now that she’s well into solids, she’s getting protein from other foods now as well. Flax seed oil is full of essential fatty acids and good for anyone. The blackstrap molasses is for iron, but I sometimes put slightly less than a tablespoon, since I know she’s getting iron elsewhere. I chose this powdered multivitamin with some added probiotics since I found that a lot of the refrigerated probiotics you find at most health food stores sometimes contain traces of milk. Check your labels people! I was putting vitamin D drops in her breast milk bottles, but since the rice milk and powdered vitamins both contain the vitamin D, I didn’t find it necessary to add more to the final product. Vitamin D is really important, but too much of it can be a bad thing sometimes. The one thing I’ve found though, is that the protein powder and bits of the probiotic don’t dissolve completely so I either re-blend it when making her bottles, or shake it really good. We also have to ‘swirl’ it while feeding her so she gets all the good stuff that settles. She seems to enjoy it and it actually tastes pretty good. She now gets at least one rice milk bottle a day and I also use it to mix her morning cereal. It’s been a great addition to Lark’s diet! Again, please consult your child’s doctor…unless you’re like me and would’ve tried it anyway…(just sayin’! Because sometimes you have to trust your instincts!) Often times we’re led to believe that because something isn’t the ‘traditional’ way to do things, it’s bad or harmful. I feel confident in this formula because it’s exactly what’s in mainstream infant formulas, the protein and added vitamins, but unlike mainstream formulas, it doesn’t have any added chemicals or unnecessary artificial additives. And that was important to us regarding our daughter since she’s forming a pattern of sensitivities in her life thus far. I saw this ad circulating on facebook, and it was too hilarious not to share. Plus, I’m now raising a daughter, and things like this are all a part of my future now. I love companies/people who promote girl power and approach ‘taboo’ topics head-on. Especially since tampon and pad commercials are generally an embarrassing depiction of what really happens. Wait, you thought everyone lost tiny amounts of bright blue liquid? Whatever marketing team is behind this ad is genius! It’s for a company called Hello Flo, which is one of those monthly subscription services, but full of tampons. 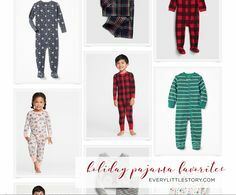 Their website is adorable, their logo is adorable, and yeah, I totally just signed up for their newsletter! The months are coming so fast now, I feel like I can’t keep up! You were 7 months on the 7th! Still being tiny…you were about 15 lbs at 7 months and still wearing 3 month sizes, but starting to fit into some 6 month! Clothes are lasting awhile around here! On March 9, mama and daddy’s 8 year anniversary, we headed down to Monroe, MI to see your cousin Lucas get baptized at the same church where your uncle Jesse and aunt Julie got married. You were the prettiest little sequined dress that we don’t have a picture of because it gave you a HUGE rash on your face. Right after the service you were back in comfy clothes. Julie’s mom had a little party for Lucas at their house and after that, we headed home. You were such a good girl the whole time and a good little road-tripper. During mass you were so happy and squealing loudly, it was making us giggle! The allergy saga has continued. We had some more health scares this month, which was very stressful and we were very sad and felt helpless! You were still having random rashes and hives here and there and on March 14, I gave you breakfast like any other day. Some bananas and cereal, which you scarfed down like any other day. Shortly after, the telltale rash started forming on your face so I gave you benadryl right away and went to get you dressed when suddenly, here came the vomit, yet again! This time wasn’t as much vomit as before, but it was awful to see you feeling so bad again. I ended up staying home from work that day, just in case. You were a little fussy, and slept on my chest for quite awhile but when you woke up you were mostly happy. I went to change your diaper early afternoon and your breathing changed in a split second from normal to extremely labored with a very prominent (and scary) wheeze. I knew exactly what it was, since I’ve dealt with all of this my entire life, and being that you were having allergic reactions, I knew it could be serious. I had been on the phone with your doctor earlier that day, so when I called about this, they wanted to see you immediately. We headed over right away and the nurse remarked how calm I was, and I was, mostly, because where are hysterics going to get us?! But underneath the cool, I was so worried! The nurse checked you over, you still had some rash to your body and we were told to wait for the doctor. She came in, looked you over, had a listen and heard nothing but perfect breathing. She started to say something to me and I said, “uh, you need to listen again NOW,” because it was starting all over again. She listened and abruptly dropped her stethoscope and said you needed a breathing treatment ASAP! So the nebulizer came in and there we sat, while you fell asleep to the buzz of the machine. They prescribed us a nebulizer for home, you know, just in case…and also confirmed that you were sick…again! When it rains, it pours! Mama picked up the machine from the medical supply store and we had some stuff to do that afternoon, and that turned into a late dinner, so we picked up the medicine for the nebulizer after dinner. I knew it would take time to fill the prescription anyway, but those slow pokes STILL didn’t have it filled by 9 o’clock that night! I was so angry. Then they informed us that they were out. So we were left scrambling late on a Friday night for something you may need to breathe! Luckily, dad was able to get to a Walgreens who had what we needed. We had really hoped you were okay and that this cold and breathing problem would resolve quickly, but that entire weekend was just awful. You were so sick, coughing, tired and needed breathing treatments around the clock. I barely slept, in fear that you might stop breathing. It was planned that we would put you in your crib around this time, instead of in our room, but again it got delayed because there was NO way you were going all the way upstairs with this going on. You were sick all weekend and the following week you stayed home with your nana Moats because we didn’t to send you to daycare with all that was happening. We ended up getting referred to an allergist as well, to see what we could find out. It’s like your mama’s childhood all over again! I went through the same problems, which has been helpful since I have a lot of knowledge. Mama ended up horribly sick in all of this too…it was a hard month for all. For the last few months, it has felt like you were sick so often between big reactions, random rashes and breakouts, and colds and coughs! We are excited for warmer weather and hopefully a healthy spring and summer! So then, that next weekend, we decided to finally try you on goat’s milk, in the event I’d need to stop breastfeeding. As a baby, goat’s milk was all I could drink and worked wonders for me, plus I’ve read lots of other success stories with it. Sunday night, March 24, I gave you a bottle of goat’s milk. You drank it down like a champ and seemed to like it. Until about 5 minutes after you were done. You broke out in the worst rash/hives we had seen yet. In went the Benadryl, right away! We stripped you down and got some towels ready, because I just knew vomit would come. Your lips swelled, your entire face was beet red, and then you vomited, right on the living room floor. Thankfully we were prepared and your dad was able to get a towel down right before it happened. After you puked, the swelling started to diminish. And since the swelling stopped, we decided to just monitor you, with stuff ready in case we needed to head to the hospital. You seemed a bit better, until the hives started getting bigger and bigger! You had so many hives on your inner thighs, that they turned into one GIANT hive that covered most of your inner thighs on both sides. You had one on the back of your head about the size of a quarter and multiple large ones elsewhere. We were scared, but you were STILL happy as a Lark, even through the chaos. Your breathing never suffered, and with the swelling gone, we ended up staying home and the hives went down. You were left with a blotchy rash for the rest of the evening and were very tired, but you were fine. No goat’s milk for you!!! We had no other issues for a few days, until that following Thursday, when you puked on the daycare lady after breastmilk…I was literally sick to my stomach because I felt like that was the LAST thing you could eat/drink and what would we do?! There was no way we could afford special formula and I could change my diet for breastfeeding, but we weren’t sure what exactly you were allergic to…I was so upset, dad was always reassuring me, and we were doing our best to keep you safe and healthy. On March 31 you saw the allergist and we discovered you are allergic to Dairy (no surprise), Eggs (complete surprise) and cats (this broke mama’s heart). So then I started a dairy/egg free diet for myself and have kept you on breast milk and was able to go back to a normal schedule of solids. The guilt I feel for passing this on to you is immense, and the guilt I feel for not knowing you were allergic to milk and eggs is also immense, since I continued to eat them. But all doctors involved discouraged me changing my diet until there was answers, and even then the allergist said it could help, but it may not…after a few days of no milk or eggs, your eczema started to improve and your rash frequency went down quite a bit. You’re still getting some rashes and itchy eyes, which we are pretty positive are from the cats, and we’re evaluating that situation as well. But you’ve been doing great. Your attitude through everything has been amazing. Always happy, just need some snuggles sometimes, which we are more than happy to give. Your being happy is both a blessing and a curse because sometimes we can’t determine how bad something really is since your mood is so good! But we are so thankful for your precious, good-natured spirit. You really are a trooper and we’re so glad we are on a path of health for you! The allergist is quite certain you’ll outgrow it all and wants to retest you at a year. So for now, you still get mama’s milk and mama gets NO cheese! But it’s worth it to have you healthy. I’ve also started supplementing with a formula made absolutely from scratch using rice milk. I found this alternative on my own and the allergist agreed that it’s a wonderful option. You love your rice milk! By 7 months, you were sitting up so well and you don’t topple as much anymore. You’re also trying to crawl with all your little might! You rock back and forth on all fours and move a hand or knee here or there, then quickly get frustrated when you’re not moving! You love to sit on the floor and play with your toys and play mat. You have a wooden animal puzzle that you love taking apart and trying to put back together. It always amazes me how smart you are and how quickly you catch on! You still adore your rainforest jumper and really get those legs going. You still prefer to be standing, with help, of course and have been oh so vocal! Which we are just getting a kick out of. You’re eating solids like a champ, and you really love your fruit!! We also celebrated your first St. Patty’s Day where mama dressed you up in your shamrock best! You really are our good luck, little Irish charm! As always, you’re just an absolute joy. We just can’t ever get enough of you. 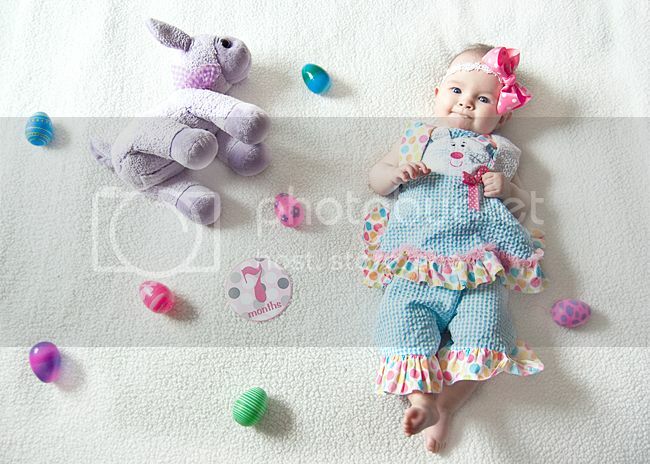 Your cute little bunny outfit is from your Nene and Dodo in Hawaii! It’s late at night. Lark is peacefully asleep in the crib just next to me as I type. Rain is tap-tap-tapping on the roof above, muffled every so often by the booming sound of thunder. Sure it’s frightening at times, and sometimes very overwhelming. It can be cold, striking you wherever you happen to be exposed. Or it can be warm, seeping right into the soul of you. It can refresh you on days you need a reawakening, and it can flood every inch of your world in an attempt at never being contained. It’s a powerful thing, with the ability to wash away the bad, to cleanse your life, and also with the ability to wash away the good, leaving you hopelessly searching for that sunshine after the storm, and that perfect rainbow. That rainbow that always comes, reminding you that weathering the storm is all part of the bigger picture, all part of life’s purpose. With rain comes growth and revival. With rain comes a renewed sense of being. With motherhood comes growth and revival. With motherhood comes a renewed sense of being. “Rain” is the April writing prompt of The Mommy Blogger Collective. In addition to a monthly writing prompt, the collective hosts a monthly blogger featurette.